The residency fair is always a popular place for medical students to be during the Family Medicine Education Consortium NE region meeting. At the 2010 meeting in Hershey, PA, there was an added bonus in that the kids from Reach, Inc in Central Pennsylvania also performed for us. REACH is a visual & performing arts and education organization promoting Greater Academic Achievements through the performing arts. And, you'll see in the video above just how inspirational these kids are and this program is. Enjoy! 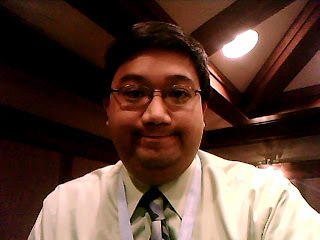 Thanks to Larry Bauer who recorded the videos above at the 2010 Family Medicine Education Consortium meeting in Hershey, PA. In one video, you'll see meeting attendees sharing why they enjoyed this year's meeting. And, in the other video, you'll see a session where people are learning to square dance. Enjoy! It's always great talking with med students at the Family Medicine Education Consortium NE region meeting. 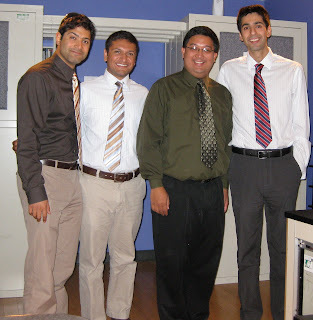 At the 2010 meeting in Hershey, PA, I was able to speak to these three students about their experience at the meeting and why other med students should attend. Enjoy the video above! Since I'm passionate about creating content, I recorded some video, edited it when I arrived at the hotel, and uploaded it for all of you to enjoy (hehe). It was a really nice drive to Hershey, PA getting ready for the 2010 Family Medicine Education Consortium NE Region meeting. As you'll see in the video above, the fall leaves gave a great backdrop to today's drive. I'm really looking forward to this year's meeting, my panel presentation this weekend, networking with Family Docs, and letting them know about social media. Thanks to Kat for being my co-host for Doctor Anonymous Show 191. This was a typical Saturday night show where we share a little bit about our past week, talk about some news stories, and relax with our friends in the chat room. In the video clip above, you'll see the opening moments of the show. As always, you can listen to the entire audio podcast in the sidebar of this site. Or, if you like, you can download Show 191 from the show's iTunes page, and listen any time. I also invite you to check out the show's facebook page and hit the huge "Like" button at the top. Finally, you can also check out other video segments from past shows over on my you tube page. Thanks as always for your continued support of my blog and of the show! Thanks to all those who were able to listen to Doctor Anonymous Show 190 live last night. 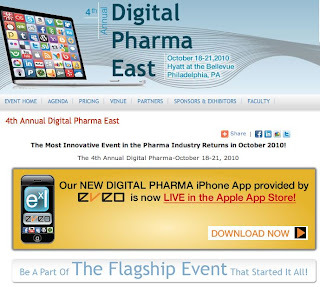 I talked about this week's Digital Pharma East meeting in Philadelphia. During the show, I talked about the 2 panels that I was lucky enough to be a part of. I also talked about some people that I met at the meeting. In the video clip above, I make some predictions of where I see the industry going. There is no way that pharma or even docs like me are going to push physicians into digital or into social media (at least right away). Who will push docs in this direction? Check out the video above to find out what I think. You can listen to the entire audio podcast in the player in the sidebar. Or, if you like, you can go to the show's iTunes page, download Show 190, and listen at your leisure. I also encourage you to check out the show's facebook page and hit the big "Like" button at the top. Finally, if you enjoyed the video above, I encourage you to check my youtube page. Have a great weekend everybody! 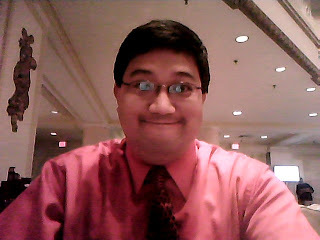 I took a lot of video while at the Digital Pharma East 2010 conference this week in Philadelphia. I put this video wrap-up video really fast so that I could share this with all of you. (Apologize for all the non-ideal lighting. Hey, I'm not a videographer lol) The music is "Goodbye Philadelphia" by Peter Cincotti. I also invite you to read Post #1 and Post #2 from the meeting along with Doctor Anonymous Show 190. Thanks for a great meeting! I'm having a great time here in Philadelphia at Digital Pharma East 2010. I'd like to thank the conference organizers for asking me to take part in the conference. I'll talk about the panel that I was on during a separate post. Usually during a meeting like this, I get to meet a lot of great people. And, I know that I'm going to probably offend someone if I don't mention everyone in this post. For that, I apologize. However, for me, the highlight during the conference was meeting Berci Mesko, MD who is the founder of Webicina and ScienceRoll.com. He spent 24 hours traveling from Hungary to take part in the conference. I remember interviewing Berci in the early days of The Doctor Anonymous Show. And, he woke up at about 2 or 3am to talk to me live from Hungary. We had a great conversation about social media. He told me that my blog and my internet radio show is a part of the curriculum for his Internet In Medicine University Course. 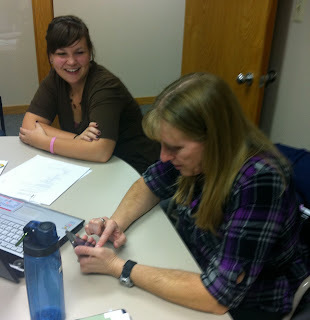 We discussed me recording a video for his students about physicians in social media. He even told me that The Doctor Anonymous Show is a trivia question in his course. He is presenting today and he was interviewed at a session yesterday. I also invite you to check out Berci's update. Yesterday, I was able to hang out at the studios of the Radio Rounds show/podcast on the campus of Wright State University in Dayton, OH. They broadcast Episode 410 live at noon eastern time and their guest was a recorded interview with Howard Dean. In the video above, you'll see the what happens behind the scenes during a live podcast. It was so interesting seeing how the four co-hosts coordinated to make this show happen. As they talk about in the clip, this is the first time that these four have been in the same studio for a number of months. But, you'll be able to see the rapport that this tight knit group has. I also invite you to check out the Radio Rounds crew from Doctor Anonymous Show 183 from a few months ago. You can download Show 183 how from the Dr. A iTunes page. I also invite you to check out the facebook page for my show. And, if you enjoy the video above, check out others from my YouTube page. Enjoy! I've had a lot of titles in my life. But, "Twitter Mentor" has never been one of them - until now. Over the weekend, I was asked to lead a discussion about social media with my friends at the Ohio Academy of Family Physicians (OAFP). I've been involved with the organization all the way back to when I was a medical student. The organization, lead by OAFP President Dr. Sarah Sams (pictured to the right above), has made it a priority this year to get involved and learn more about social media. This is where I come in. Not only was I asked to help come up with a strategy, Madame President asked me what twitter was all about and how to get signed up. In the picture above, Dr. Sams is tweeting for the first time. This was also interesting, because in last night's HCSM twitter chat, question number three was this: You’re charged with setting a colleague/MD/exec up on social media. Who should they start following, listening to, and engaging with? Why? What comes first? In the HCSM chat, they recommended finding a kind of social media mentor - which I totally agree with. I mean, hey even CEO's of companies are asking for help from the tech savvy set. Sarah has been great to work with on this. 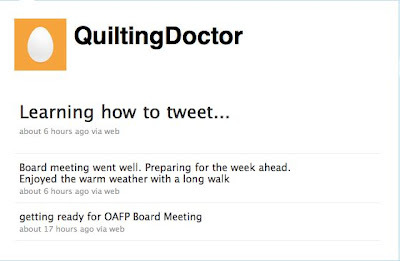 I encourage you to give her a follow @QuiltingDoctor - In addition, give a follow to the Ohio Academy of Family Physicians feed @OhioAFP. Thanks so much! Thanks to my co-host Kat for joining me for Doctor Anonymous Show 189. Topics on the show included my travel from Seattle, some current news events, and me whining about the Ohio State loss last night. In the video above, we discuss a news story from the week talking about prescription drug abuse. As always, you can listen to the entire audio podcast in the sidebar. Or, if you like, you can go to the show's iTunes page, download Show 189, and listen at your leisure. I also invite you to check out the show's facebook page and press the huge "Like" button at the top. Finally, check out my youtube page. Thanks for your continued support of the show! One of the most common questions I get is this: "Why should physicians get involved in social media?" 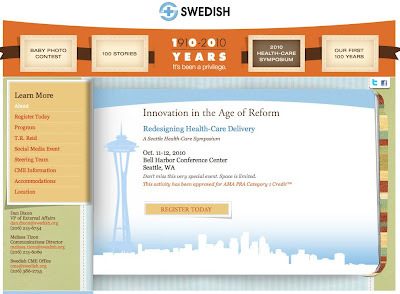 This past week, Swedish Medical Center in Seattle had a social media conference of which I was fortunate to be a part of (#Swedish100). I invite you to read more about the panel that I was a part of at this link here. However, there was a lot of buzz this week generated by the presentation by Wendy Sue Swanson, MD who is otherwise known on twitter as @SeattleMamaDoc. She makes the best case of why docs should be involved in the social space during her inspiring program. Check out the video above. This should be required viewing by all docs and all those who doubt that physicians can make an impact in social media. Life definitely keeps you grounded. Today has been a time of emotional ups and downs. Things started off on quite a high and I was finishing up the Swedish Medical Center Health Care Symposium. It's fun doing the entire live tweeting thing. Not only does it keep me on my toes as far as paying attention to the lecture and tweeting that out. 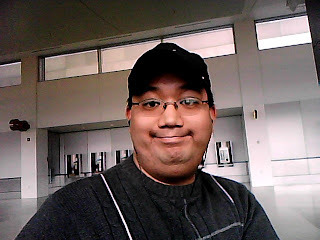 I was about 30 minutes before boarding my flight at SeaTac, when it was announced that my flight would be delayed for 2 hours due to mechanical problems. I knew that I was going to miss my connecting flight. So, I knew that I had to rebook my flight - hoping to get back to my home airport tonight. I was told that it was impossible to get home tonight, and that the earliest that I could get home was tomorrow. Needless to say, I was really upset by this. No only am I in the office tomorrow, I'm also on call tonorrow night. Being mad and embarrassed, I had to call my office to let them know that I had to cancel most of my morning patients and to let them know that I would not be able to be on call until I got back in town. As soon as I was able to arrange that, I heard the announcement that the "mechanical problem" was now fixed and that they would be boarding immediately. I had already got new boarding passes, and I could not get things switched back. I would still miss my connecting flight anyway. For the next few hours, I remained mad. But I tried to make the best of things, by getting back to watch the live stream of #Swedish100 conference, take the picture above, and tweeting away again. That was fun to virtually re-connect with friends - at least for a little bit. Our moderator, Nick Dawson, did a fabulous job at keeping us on track. As you'll see in the video above from our panel, he did a great thing in which he asked the audience if they had any questions. I think those opening thoughts really guided the panel in our discussion. Nick also asked about the composition of the audience. I was pleasantly surprised by the number of physicians in the audience. The other panelists included Kent Bottles, Jen Dyer, and Bryan Vartabedian. Some themes that came out of the discussion were the issues that physicians are concerned about - Payment reform for electronic communications, Patient privacy concerns, and Liability issues. Another interesting theme that came out was showing a lot of love for twitter. If you had any question about how physicians utilize twitter for social media consumption - You must watch the video above! In addition to our panel, there were presentations by Dave deBronkart and Wendy Sue Swanson. (As of this posting, EPatient Dave's talk is available, but SeattleMamaDoc is not - yet) I was also able to meet a lot of great people including Bill Thatcher, Greg Guenther, and Anita Beninger. I was even interviewed by Jessica Levco from Ragan Communuications. I'll post that interview here when it is made available. If you're not able to attend the event in person, that's ok. Swedish is making it available on a live video stream. If you want to watch the Live Video Stream, just go to http://bit.ly/sw100live - Also, as you're watching the live stream, use twitter to take part in the conversation by using the hastag #Swedish100 - They will also be using the social media tool called CoverItLive to try to funnel some of the conversation. Back in the dark ages only a few years ago when the intersection of medicine and the internet was in its infancy, there was not really a phrase or a word coined to describe medical people who liked the internet. Then, for lack of a better term, "Medbloggers" was used. This was kind of solidified by the weekly blog carnival called "Grand Rounds." 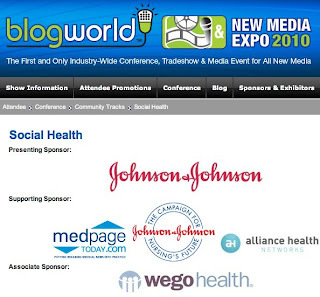 In addition, only a year ago, there was the first "Medblogger" track at the huge tech conference called BlogWorld Expo 2009, of which I was lucky enough to be asked to be a speaker for. Then, earlier this year, in the spring, I saw people using the phrase, "Social Health." This was especially prominent with the event named "SouthBy Social Health" - patterned after the very popular geek conference called "South By Southwest." Now, in 2011, the South By Southwest meeting is going to have a "Social Health" track of programming. In addition, in Las Vegas this week will be the "Social Health" track at the 2011 BlogWorld Expo in Las Vegas. So, if you want to be one of the cool kids and want to be seen on the cutting edge, forget Social Media - Call it Social Health, and hold your head up high! Ok kids, I need some help here. It seems like over the past month or so, I've been seeing something peculiar in my twitter stream. The links I'm seeing are for "newspaper" like appearances of twitter stream hashtags. Now, don't get me wrong, I'm not calling out any particular hashtag "newspaper," but, in general, I just don't get. If I wanted to follow all the people these "newspapers" are following, I would do that. I don't need another twitter aggregator within my twitter stream. I do understand that platforms like this popped up since the introduction of the iPad and ipad apps like flipboard (BTW, I love filpboard when I use it on the iPad). Now, I'm not going to completely write this off. So, this is where I need your help. For those of you who have a paper.li page and for those of you who read it, help me out here. Why do you use it and why do you read it? Leave your comments below. Thanks so much! We're going to be talking a lot tomorrow about Twitter and other social media platforms at the Pre-Conference meeting of the Swedish Medical Center Health Care Symposium. But, I just wanted to share something that is really cool about twitter. Twitter gives me the opportunity to be in contact with people I would never have access to. For example, the CEO of Swedish Medical Center just started a twitter account. Just to kind of be funny, I sent him a twitter message. In the video above, you'll see him type a message back to me. When I saw this, I was really amazed. That's really cool! In the video above, you'll see a video blog post, portions of which were recorded yesterday and this morning talking about my first day here in Seattle. If you enjoyed this, I encourage you to check out other videos over on my YouTube channel. Thanks so much! Thanks again to Dana Lewis for joining me for Doctor Anonymous Show 187. The topics we discussed included the upcoming 2010 Swedish Medical Center Healthcare Symposium, the success of the #HCSM (Healthcare Communication & Social Media) chat, the #MDChat that occurred last week, and other topics as well. As always, you can listen to Doctor Anonymous Show 187 on the sidebar of the blog. You can also go to the iTunes page for the show, download Show 187, and listen at your leisure. I also encourage you to check out the Facebook page for the show, and my YouTube page. Thanks for your continued support for the show! Had a great show from Seattle last night. Thanks, as always to Kat for joining me for Doctor Anonymous Show 188. We talked about a lot of topics, as we usually do. In the video segment above, we discuss the interesting topic of what happens when people disagree online. As a reference, check out blog post 1, blog post 2, and blog post 3. You can listen to Doctor Anonymous Show 188 on the sidebar here. Or, you can go to the show's iTunes page, download the show, and listen at your convenience. Also check out the show's Facebook page, and hit the big "Like" button at the top. Finally, I invite you to check out my YouTube page. Enjoy! I hope you can join me tonight for Doctor Anonymous Show 187 when our guest will be Dana M Lewis who is the Interactive Marketing Specialist for Swedish Medical Center in Seattle, Washington. As I discussed in yesterday's post, Dana is also the founder and moderator of the #HCSM twitter chat that takes place Sunday evenings. I invite you to join me for Doctor Anonymous Show 187 when our guest will be Dana M Lewis who is currently the Interactive Marketing Specialist for Swedish Health System in Seattle, Washington. Dana is probably known more for being the founder and moderator of the #HCSM twitter chat that takes place Sunday nights. HCSM stands for "Healthcare Communications and Social Media." 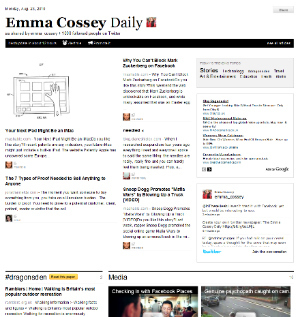 There's a great article about Dana over at Xconomy.com as well as at the Swedish MC site. In the article, it states that she was a freshman in high school when she was diagnosed with Type 1 diabetes. Beginning at that point, Dana found a passion for communication which led her to achieving a Bachelors Degree in Communications with majors in public relations and political science. She has also won a number of awards including Best Non-profit Microblogging Award from the Society for New Communications. So, join us on Thursday, October 7th, 2010 at 9pm Eastern Time/6pm Pacific Time for Doctor Anonymous Show 187. In addition, we'll be talking about the upcoming 2010 Swedish Health Care Symposium, of which, I'll be going to and being a part of the Pre-Conference. Hope to see you for the show! The next few days are going to be very busy for me, the blog, and for the Dr. A Show. To try to summarize things, I recorded the video above to let you know what is coming up. In addition, I'm going to be writing separate blog posts for most of the events above. I'll keep this video at the top of the blog in case you (meaning in case I) get confused on what is happening over the next few days. Enjoy! Thanks again to Ron Davis and to Kelly Grayson for being on Doctor Anonymous Show 186. They talked about their podcast called Confessions of an EMS Newbie, and they went out of their way to do it. Ron switched his class schedule to be on the show. And, Kelly called in from the EMS Expo conference in Dallas - after being on another bunch of podcasts earlier in the day. In the video segment above, Ron talks about the origins of the podcast, Kelly talks about what drew him toward the medical field in the first place, and both talk about the experience & future experience of taking electronic tests. You can listen to the entire audio podcast on the player in the sidebar. You can also download Doctor Anonymous Show 186 from the show's iTunes site and listen anytime. I also encourage you to check out the Facebook page for the show and hit the big "Like" button at the top. And, you can check out other videos on my you tube page. Thanks for your continued support of the show!